Kitchen knives are a must-have in every home, whether you enjoys cooking on a regular basis or only use it once in a while. After all, you never know when you would feel like cooking, and the security afforded by having a functional knife within easy reach adds to the probability of these impulse home-cooking incidences. But for those who actually love cooking, the choice of kitchen knife set becomes all the more important. So if you are looking for a top rated kitchen knife set; You have come to the right place, Because whether you are an amateur cook or seasoned one, this article aims to help you find the best cooking knife set for you. Well! Choosing a good cooking knife set is not that easy. You have to be very careful to compare essential features offered by different brands. so we have highlighted the five most popular and high in quality knife sets from the best cutlery brands that are already rated high for their outstanding properties and performance. To help you choose the best set for your needs, we’ve identified four kitchen knife block sets—ranging from high-end Western and Japanese-style knife block sets to a starter ones. *There are several other models that are more expensive to the ones listed here. but, I wanted these kitchen knife sets to be more budget friendly. So what is the best kitchen knife set to buy in 2019 ? Before that you need to understand the essential aspects for buying best set online. A chef knife – A multipurpose knife best at slicing, mincing, dicing, and chopping. A paring knife – Best at trimming and peels fruits/vegetables and garnishes. Those are the 3 knives you should seek in every kitchen knife set, but you can look for additional knives, but its all depend on your cooking style. Boning knife – A knife for detaching meat from the bone, it usually comes with a narrow blade. Fillet Knife – Its a more flexible version of the boning knife, and its good for delicate fish. Honing Steel – For keeping your knives sharp and steady. Carbon Steel blade – Well-known for its extra sharpness, ease of sharpening and holding an edge longer the stainless steel blade, but on the other hand carbon steel blades need extra care and maintenance which is prone to rust. Stainless steel – Hard to sharpen, poor edge retention but good stain and corrosion resistance. High Carbon stainless steel – It is a combination of carbon steel and stainless steel to provide the knife with extra sharpness, edge retention, and rust/corrosion resistance. Ceramic – One of the sharpness knives out there, but they may chip and break easily beside it is hard to sharpen. VG10 – Most popular among Japanese knife makers, its a combination of molybdenum, chromium, vanadium, carbon, and cobalt to give the knife an excellent sharpness, extra edge retention, and corrosion and rust resistance, the only downside about the VG10 it is brittle and not flexible enough which make it prone to chipping. Different manufacturers offer different options for warranty, always prefer to check its warranty to have complete peace of mind. A product with a long warranty is always the best purchasing decision, and always double check what it covers exactly and not just the length. A large storage block can fill a bit of room on your counter, always ensure that the set you are considering to buy will fit perfectly on your counter top or your cabinet. Its is the sharp edge of the blade or a knife or other cutting tool, and it should be running from the tip to the bolster of the blade, to give better cutting techniques, easier honing and sharpening. Somehow it is a personal preference matter, but always look out for ergonomic design for less hand and wrist fatigue, and textured or non-slip grips. And i do prefer full tang construction specially If you cook on a regular basis and you use the heft of the knife to cut hard ingredients, so you will never have to worry about your knives breaking at the handles. Which means the weight of the knife equally distributed between the handle and the blade, if you are planning to work with the knife for a long session of food prep, then balance is one of the first things you must consider before buying. I think it more a personal preference too, you have to try out some knives, to get to the one that fits you. High price tag is not a factor of good quality kitchen knives, nor a brand name, to get the best of your money always try to find a knife set that meets the points we mentioned above, and of course fit your budget, in this article we reviewed 4 different kitchen knife sets with varying price range to help you with your decisions. If you are looking for a professional high-end forged German kitchen knife set, the Wusthof classic series is one of the best you can possibly get. Indeed, the classic is one of wusthouf finest kitchen knife lines, this set is available in 7 pieces, 9 Pieces and 12. Okay, let’s take a look at The Wusthof classic 7 kitchen knife set which includes the most useful knives for your kitchen use, each knife in this set is precision forged from single piece of high-carbon stainless steel ( x50CrMov15) that contains molybdenum, chromium, and vanadium to add more hardness, durability, corrosion and stain resistance to the blade. Wusthof added an exclusive technology called EPtec to this series to enhance blade sharpness by 20% and to last much longer even after extended use, And a tapered cutting edge to reduce the drag when slicing. And because Wusthof is a fully forged knife it has a full tang that goes the entire length of the triple riveted handle to add extra durability and robustness. In addition to full thick bolster to add more balance and heft ( its great for whom prefer the weight of the knife for cutting and hammering stiff ingredients). Wusthof classic has 14-degree cutting edge on each side which means its sharper than many Japanese and western style kitchen knives. And 58c Rockwell hardness means its hard enough, to worry about sharpening or maintaining the edge. and the most important a safe and non-slip grip even in wet or greasy conditions. The classic is fully forged with superior blade and better edge retention while the gourmet is a stamped kitchen knife with a lower blade quality. Kitchen Shears come apart for easy cleaning. If the high price doesn’t hurt you, this kitchen knife set is a compelling purchase. Constructed to the highest standards in the Solingen area of Germany. the block has a slender footprint on the counter. If you prefer lighter-weight kitchen knives, these knives aren’t likely to be your favorite. Another top-rated kitchen knife set from a professional and well-known Japanese Cutlery brand. The global g835/Ws – comprised of 5 beautiful high-quality kitchen knives and a stainless steel block, designed to cover all your cooking tasks. The global blade is thinner than most of the traditional knives, which allow it to smoothly slice through the food without causing any damage, and a long taper and prominent edges on both sides to maintain the edge sharpness as long as possible even after extended use. *The edge is symmetrical in design to fit right and left-handed users. and the textured stainless-steel hollow handle which filled with the precise amount of sand to deliver a perfect balance to the knife, besides an extraordinary build to eliminate hiding spots for foods. In a nutshell, every piece of this kitchen knife set is manufactured to extremely high and exacting Japanese standards. Anyone who is looking for a little more than a typical kitchen knife set. Symmetrical in design, will work great for right and left-handed. Life-Time warranty against defects in materials and workmanship. Stamped from a single piece of steel. Knives made of high-Quality materials. The handle may get slippery and greasy after long working hours. Not much room for knuckles. The Insignia Steel 18 Piece Knife Set by Chicago Cutlery is a set of professional knives for any busy kitchen and a perfect set for an upgrading family or as a gift for a starting family, and a must-have kitchen product for chopping, slicing, dicing, and mincing. The set composed of 18 pieces, so you no longer need to worry about buying individual knives at a higher price, especially if you are only an amateur cook who does not know what each knife is for! The whole set comes with forged high-carbon stainless steel blades and handles, since the knives are forged its means they feature a full tang extends the full length of the knife from the tip to grip, to give you added strength, control, balance, durability and to offer ultimate sharpness and to retain its edge perfectly even when re-sharpened time and time again. Chicago Cutlery Insignia 2 blades contain high carbon content, so they are much stronger, harder, very easy to re-sharpen, and has a perfect resistant to stains, pitting, and rust. It also comes with a forged bolster to keep your fingers from running onto the blade. And black riveted black ergonomic polymer that offers a slip-resistant minimizes wrist tension and designed with balance and comfort in mind. 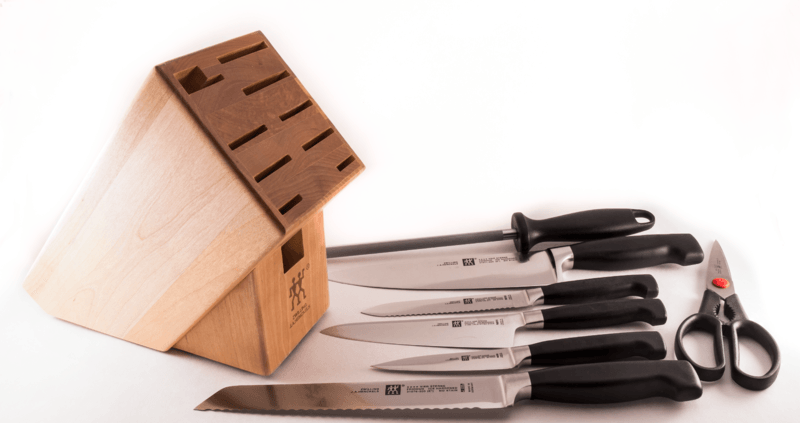 Each knife comes with optimum sharpness to give you a precise cutting experience, and All of them can quickly be organized in the 18-slot rubber-footed cherry wood block that comes with the set! Any one who needs a robust, balanced and comprehensive kitchen knife set without breaking the bank. One more high-end forged German style kitchen knives set offered by mercer culinary a well-respected name in the cutlery industry. They have been in the market for 30 years it’s a short period compared to other old kitchen knives companies, but mercer culinary has proven it’s self over the years that it is first-rate kitchen knives and professional culinary tools makers. So I had to review one of their best kitchen knives set, it’s the mercer culinary genesis 6 pieces with a block. A high-end forged kitchen knives set I defiantly recommend to everyone who’s looking for a good kitchen knife set for a reasonable price. Since it’s a full forged kitchen knife set, thick bolster can be found as well a full tang handle. All those elements combined together provide the knife extra strength, durability, counter-balance, and control. The blade has 58HRC Rockwell hardness for easy sharpening and outstanding edge retention. and a taper ground edge for more stability and better slicing. Let’s get to the part I like the most about this kitchen knife and it’s the handle, the mercer genesis series has an ergonomic Santoprene handle offers excellent comfort, slip resistance And soft textured grip, on the contrary to the mercer renaissance series which has the standard looking traditional triple riveted design. A sleek, elegant and stylish glass block that allows you to see where every knife is located in the block. it can be quickly assembled and disassembled for easy cleaning. due to the shape of the block, it’s not angled as most traditional blocks. Anyone looking for a good kitchen knife set, without the hefty price tag. Handle can withstand hot and cold temperatures. Comfortable, soft and safe grip. The glass must be cleaned from time to time. If you can’t afford the global kitchen knife set and you still looking for high quality stamped knives set that is highly recommended by chefs and home cooks and for bargain price, then the Victorinox 8 set is the best choice for you by all mean. I definitely recommend this Victorinox kitchen knife set for anyone looking for a razor-sharp kitchen knife set for a reasonable price. Comes with kitchen shears, honing steel and 7 kitchen knives made of high-carbon stainless steel and went through a special tempering process by Victorinox to provide the maximum sharpness and retention to the knife. the most significant thing about those knives, they are really lightweight, yet they are sturdy, tough and well balanced. Although 55-56 Rockwell hardness knives will lose edge sharpness overuse, I am not saying they are bad knives but as long you are using the knives in a proper way and honing constantly, they will last you decades. but they are not fully tanged Since they are stamped knives, so I recommend not to use it to cut or hammer hard ingredients. To wrap it up I recommend this kitchen knife to anyone on a budget since it offers almost 95% of the knives you will need in your kitchen for a bargain price. in my opinion, Victorinox can beat more expensive kitchen knife sets models in quality and sharpness. Just getting into kitchen knives? this set is a perfect option for starters. Light-Weight, good balance, ergonomic handle. The set offers almost all the basic kitchen knives. In this article, I reviewed 2 forged and 2 stamped kitchen knife sets with a diverse price range to make it easy for you to pick. if you prefer to work with light knives then the Global and Victorinox should be on the top of your list. On the other hand, if you prefer kitchen knives with heft and durability, then Wusthof Classic and mercer genesis should be your first picks. Hopefully, this list solves your kitchen knife set buying woes, and you will be able to buy the best kitchen knife set, that fits your budget and cooking style. Did I miss one of your favorite kitchen knife block sets? 10 Of The Best-Reviewed Kitchen Appliances, you Can Get! *Customer reviews/ratings on several platforms and their problem reports. * Ease of sharpening And Sharpness. A knife edge becomes rolled or turned from direct contact with cutting boards, bones or other hard objects, knives should be honed after every couple of uses, Honing steel will keep your knives sharper and performing at their best, but it won’t sharpen a dull knife. Do not chop the hard object and surface like glass or bone. After significant use, the steel particles become damaged and the edge cannot be brought back by honing, so sharpening is necessary. Always sharpen in the same direction, whether it’s front-to-back or back-to-front. Store your knives in a knife block or on a Magnetic Knife Rack to preserve the cutting edge. Don’t store your knives in a drawer they will dull faster and there is a chance to cut yourself. Don’t clean your knives in the dishwasher, always hand-wash and dry immediately. For More Tips: How to Keep Your Knives Razor Sharp.